don’t fake caring – Love. Life. Practice. 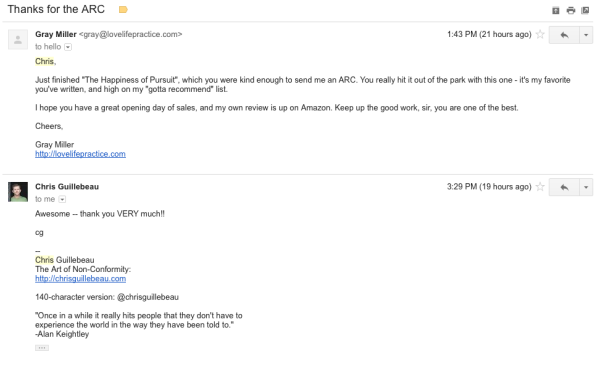 That’s a screenshot of an email I sent to Chris Guillebeau, shortly after posting my review of his new book both here and on Amazon. When I wrote it, I didn’t have any expectation of a reply. It’s the launch day! He’s wrangling twitter strategies and guest blog posts and more, trying to hit the bestseller lists. When I did get the email from him, it was brief, terse, and to-the-point: an acknowledgement of my email. It wasn’t terribly eloquent, but that made it all the more personal – this is the email I would expect to get from someone who was insanely busy but wanted to take a few seconds to let me know he appreciated my message of support. The fact that it was there at all actually felt really personal – like this was a real guy, someone I could enjoy having coffee with in less harried times. The fact that it showed up three hours later made it feel very authentic, as if he’d come across it during a day of constant checking of messages. On the other side of the spectrum was an email that I won’t post here. I was inquiring about a speaking opportunity at a convention run by a fairly successful presenter – someone who has big-media connections and is definitely a star-on-the-rise. At the same time, I did have something of a personal connection – we’d met back in the early days of podcasting at an LA convention, and while they were certainly far more successful, I would consider it a closer professional tie than, say, Chris Guillebeau. At the same time, I was very aware that I would likely get no response at all – this was simply part of the numbers game, bread cast out on the waters on the off chance I’d get a nibble. But let’s face it, I’m one blog among many, a tiny voice in a crowded room, and while I believe my message is worth getting out there, I’m under no illusions as to my “fame”. By the way, here’s a subscription link to my newsletter! You also might want to buy something from my store! You can also use this coupon code to get something from that store! Did I mention there’s a newsletter? And a store? And another store? With a coupon code? Now, don’t get me wrong; I’m all for people making money for their content. In fact, my first reaction in reading the flurry of marketing pitches was Wow, I really need to up my marketing game, I’m way too subtle. The problem was not with the marketing – it was with the imitation of intimacy, of caring, in what was obviously a form letter. I would have preferred no response to the response I got, because that just tells me that regardless of what I actually want to talk about, I’m first and foremost a source of money. Of course I realize that Chris Guillebeau might have simply figured that out a bit better than the other person. It’s entirely possible that a week ago he set up a timed delay for automated responses, carefully designed to be the kind of email a Very Busy But Still Have Time For You kind of man would send. That’s fine. The moral of the story, either way, is: Don’t fake caring. Or if you do, do it well.